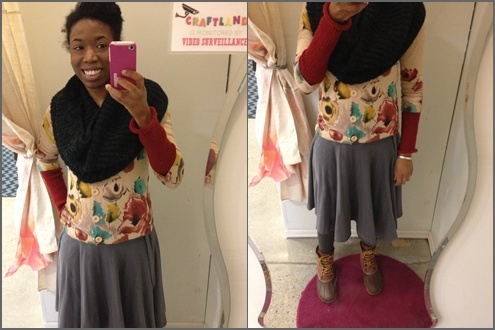 I usually just share what I am wearing while I am writing on Wednesday but today I'm sharing what I wore Thursday. Why? Because last Thursday I wore my all time favorite sweater with what has become my favorite (and longest) casual dress and I thought, what if none of my WIWW friends see this? It made me a little sad. Totally taking pictures in the dressing booth at work. It was a slow day. The pictures of what I'm wearing today didn't turn out so hot. I like my outfit but the lighting is terrible (because it's grey outside), I'm tired (because it's grey outside), and I've decided I hate my wig (because it's HUGE). I'm sharing a picture anyway, just to keep it real. We can't always think we look great, even on Wednesdays! Chandra, we'll have to find ourselves at the same clothing swap one day then! Hee hee! Going to your blog now. Happy WIWW! I LOVE your hair. Oh man. It's gorgeous! So is that cowl - it's so dramatic AND so cozy! Thanks Ashley! Yeah, the cowl is eco-friendly too because wearing it as part of my outfit means I can keep the thermostat a few degrees lower. Yay!